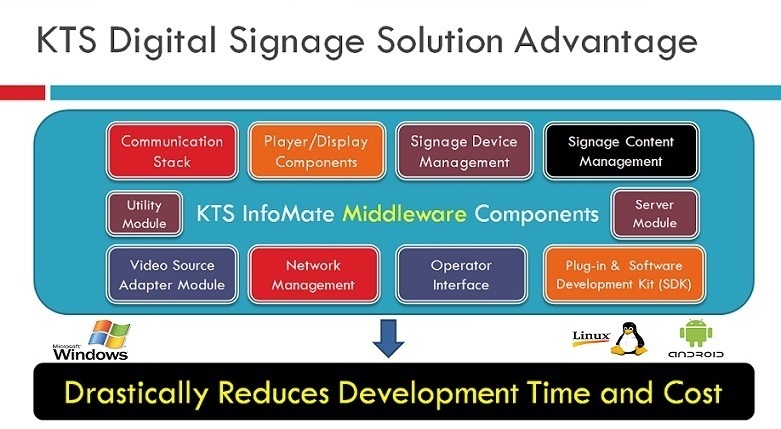 Digital Signage Software Solutions | KTS InfoMate. KTS InfoMate is designed and developed in such a way that it can be extended to suit the requirement of any organizations. Whether you are looking for a Digital Signage Solutions to small enterprise or large corporates , KTS InfoMate will be able to easily meet your requirements with little or no customizations. If you are having an existing Digital Signage Infrastructure , the chances are that our software will be able to easily leverage your existing investment thereby reducing the cost to a minimum. The links and different scenarios below will give you an idea about how KTS InfoMate Digital Signage software solutions will be able to suit the requirement of different organizations . We will be updating this page with links for each heading. Each page will also provide with a video on how to configure and use KTS InfoMate to use it for a specific business/usage scenario. 5 In Churches and Diocese. 7 In Video conferencing Scenarios. 10 In KSRTC Bus Stations. 16 In CCTV Monitoring Systems. 17 In Website Monitoring Systems. 18 In Video Channel Monitoring Systems. 27 In Police and other Camera Control Rooms. 28 In PC Desktop Monitoring Systems.